It seems people love Twitter or hate it. They’ve either found the secret to creating community and generating leads, or they find it to be a stream of junk that still finds a way to steal hours of their life. It isn’t as easy to satiate that human desire for immediate gratification from Twitter as it is from Facebook. How do you know if you are reaching millions or sitting in a room alone talking to yourself in short sound bites. You can find out. 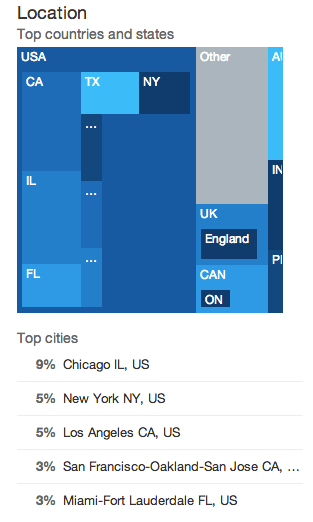 Did you know Twitter has analytics? Earlier in 2013, Twitter made Web analytics available to all users. Not everyone is aware of this yet, and many who do know have hesitated because it is tied to Twitter’s ad platform. However, you don’t need to be paying for ads, nor do you need to add credit card information on file in order to use Twitter Analytics. You can access these great stats by logging in to Twitter Analytics with your Twitter username and password. Look for these features to gain an understanding of your audience, how to better connect with them, and find out if you are on the right track. Understand who is following you. You may be surprised to find your Twitter demographic varies greatly from your Facebook demographic. I recently worked with a client who has a primarily female audience on Facebook. She used similar content and vocabulary on Twitter, but wasn’t getting the same kind of interaction. We looked at her analytics to find that her Twitter following actually skewed male. She catered her tweets accordingly, and created an engagement and following boost immediately. Another scenario could be that your balance is off-target. If your business caters to a male audience and you have a 75 percent female following on Twitter, it may be time to review your content strategy. Find out the geographical breakdown of your audience by state and country. This can be very useful in determining whether you are building an audience relevant to where you conduct business. You can make sure that you are speaking accordingly to that audience by referencing topics that may impact your priority regions. Twitter tells you exactly what your audience is interested in. This can be a great content planner. You may see that 80 percent of your followers are interested in real estate investing, 70 percent are interested in entrepreneurship, and 50 percent are interested in health and wellness. Perhaps your next blog post is about the best locations in the U.S. for entrepreneurs to buy property, start a business and enjoy an active lifestyle. You get the idea. Take a look at your analytics and see what surprises appear. How can you use this data to inform your social media strategy? Today we took a look at the who. Next time, we’ll talk about the what: Are you in fact talking to an empty room, or sharing content that people are attracted to and sharing?